Looking for some Meatless Monday Inspiration but short on time, ideas, cooking skills? 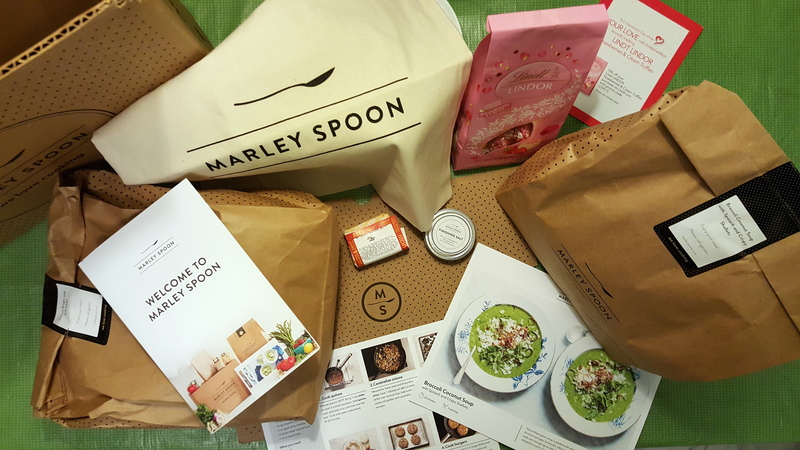 Switch it up with a recipe/meal delivery service, Marley Spoon! 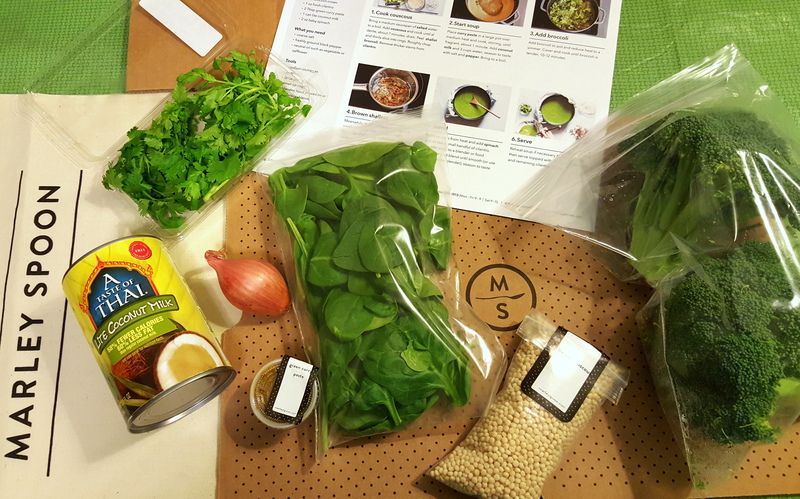 We received 2 free recipe boxes from Marley Spoon to review for all you organic peeps out there. Marley Spoon actually has a wide delivery area including the UK, Netherlands, Germany, Australia and ‘Murica (that’s layman for America). 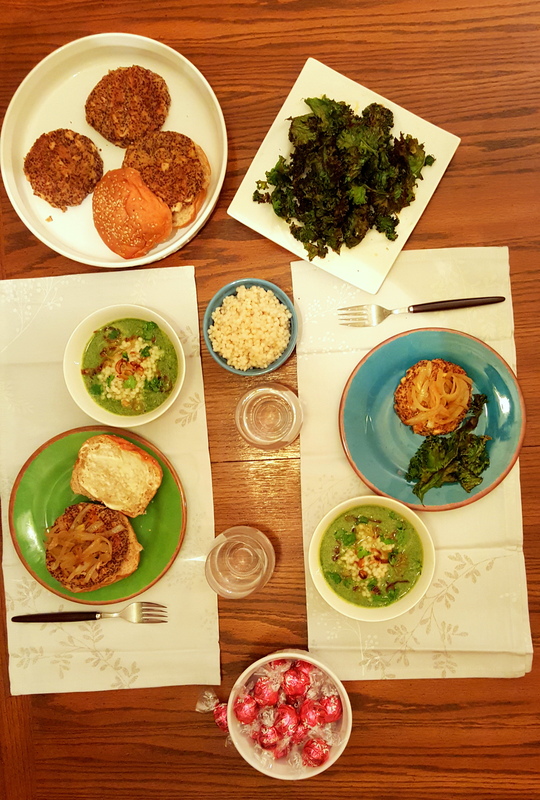 We Galentine’s Day-ed it up a little early and decided to have a cooking date night to try two recipes: Quinoa Burgers and Broccoli Coconut Soup. It is a subscription service but you can pause the service when you like. Your order is delivered on either a Tuesday or Friday in a cooler box so it keeps cook ready. A variety of 7 chef created recipes are available each week catering to different culinary preferences (meaty, veggie, global inspired, vegan, dino..ok no dino but we are checking how closely you are reading). You have a choice of a 2 person box or a family box to feed a small crowd with pricing that ranges between $48 (2x meals a week) to $139 for 4 family meals per week. We actually spend more on groceries ourselves sometimes so the pricing seems pretty reasonable for the time you save. Delivery: Delivery was on point and our boxes were waiting when we arrived. Everything is pre-packaged so no need to measure. Recipes: Recipes come with gorgeous color photos of each step and outline exactly what you need to have on hand on your own (small staples like salt and olive oil). Portions are more than what we would expect for 2 people. 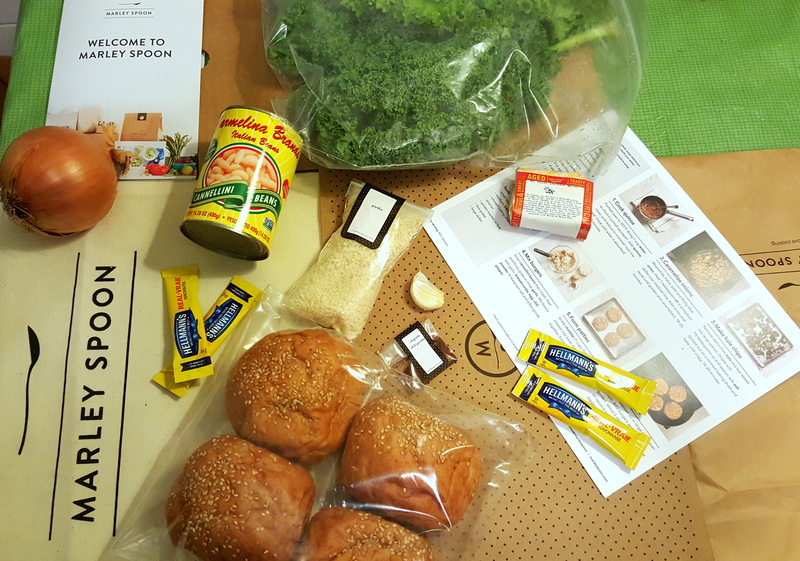 For example, our Quinoa Burger recipe yielded 5 burgers and we had plenty extra couscous and soup from the Broccoli Soup recipe. Depending on your appetite, you may be able to get 2 full meals for 2 out of each recipe (hooray leftovers!). Appearance: Both recipes looked like what was on the recipes cards when completed. We felt like fancy french chefs. Taste: The kale chips were crunchy and addictive…possibly the easiest part of the recipe box. Our veggie burgers were hearty and filling. The soup had a bi-partisan reaction…more on that below. Souper Spicy? : With cooking, there is always room to grow! With both of us being a level up from amateur kitchen goers, we think a few things could be improved. 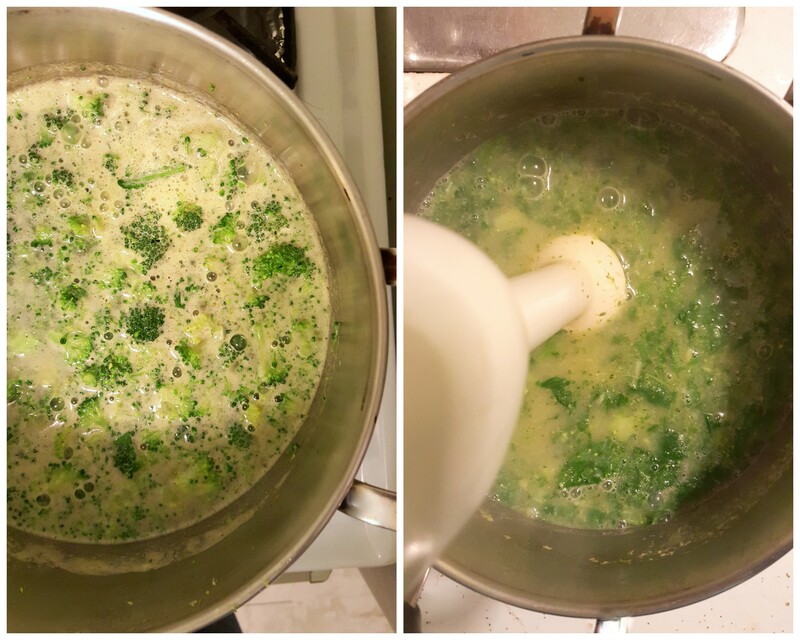 The broccoli soup recipe was extra spicy for some reason and didn’t have the creamy consistency that appears in the picture. We would have liked more of a coconut flavor and would have modified that spice to flavor ratio for some more depth. It was possibly the green curry with ginger that could have been baby spiced to improve the other flavors in the soup. Time: It took us 2 hours to make everything. For a busy person, this might not serve. One suggestion would be for Marley Spoon to provide pre-chopped or diced ingredients but we aren’t sure how this would affect the freshness of produce. Taste your dishes throughout the cooking process and modify them if you like! We added paprika and chili powder to our kale chips and were pleased with the results. Don’t be afraid to be a kitchen rebel if you know how to cook to season items to your liking. Bonding: We had a super fab time cooking together. We could see this as a intimate date night, girls night out or bachelorette type experience, or just a way to liven up the ho hum experience of weekly cooking. Overall, we loved the experience of learning to cook new recipes and spending time in the kitchen together. Ingredients are local sourced and grass fed animules, making you feel a bit at ease for what you are consuming. Food waste is cut own bu the pre-packaged format as well. If you’re looking for a culinary adventure with less effort, we suggest giving Marley Spoon a try! Use the Promo Code CHIORGANIC for $35 off your first box.